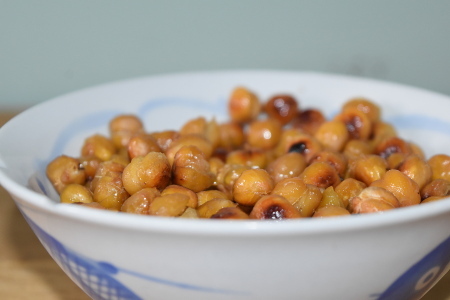 Maple smoked chickpeas are fantastic as a healthy snack and great to share around at a party. A simple seasoning is all that’s needed, because the beautiful rich smoke provided by the maple smoke pellets gives all the flavour that you need. I decided on using maple pellets due to the light, sweet smoke that they produce – it’s enough to enhance the flavour of the chickpeas without completely obliterating their natural taste. This is something that you just can’t get by cooking the chickpeas in an oven; although you can always buy liquid smoke, as far as I’m concerned it gives a harsh, artificial flavour to anything it’s in. Natural smoke is always the way forward! 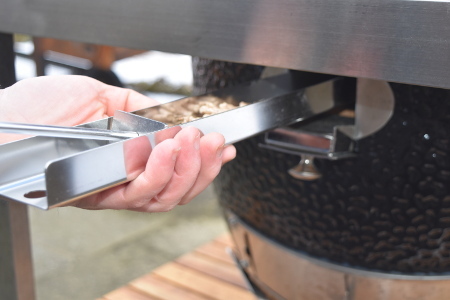 To cook maple smoked chickpeas, you will need a barbecue with a lid and heat deflector stones placed above the charcoal to create that oven environment – this allows the chickpeas to effectively bake while they are being smoked. Also place a 2nd tier grill above your normal grill if you have one. Light your barbecue, and heat it up to 200°C (392°F) – make sure that your heat deflector stones are above the charcoal and below the grill. Line a baking tray with greaseproof paper, and drizzle a bit of olive oil onto it. 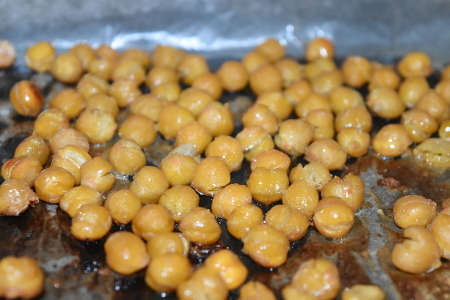 Then pour out your drained chickpeas into the baking tray. Pat dry the chickpeas with kitchen towel, removing any loose skins if you find them. Drizzle a little more olive oil over the chickpeas, and sprinkle over some salt. That’s all the seasoning you need! Place the baking tray of chickpeas onto your 2nd tier grill, closing the lid of the barbecue straight after to keep the heat in. At this point, add your maple smoke chips to the hot charcoal. I do this on a Monolith, using their smoke chip feeder system – otherwise you may have to add the chips before putting the chickpeas on the barbecue. Cook the chickpeas for around 30 minutes, shaking the tray every so often to ensure that the chickpeas don’t stick to the bottom of the baking tray. Take the chickpeas out when they’re golden brown. Allow them to cool for a few minutes before digging in – they should be lovely and crispy. Enjoy your maple smoked chickpeas!